The 2015-16 season has been an interesting one for the St. Louis Blues, to say the least. From goaltending injuries galore to rumors of trading key pieces, the Blues have had their fair share of adversity. Despite all of that, however, the team is stronger than ever. While they aren’t where they’ll want to be come mid-April for the start of the 2016 Stanley Cup playoffs, St. Louis can be proud of how they’ve overcome obstacles to this point in the season. One of the biggest question marks for the Blues right now is leadership. Captain David Backes has an expiring contract with slim chances of an extension with the team. He, however, came out of the trade deadline last week wearing the same blue note jersey he has since the 2006-07 season. Just because he’s still in the Gateway City doesn’t mean he’ll be there for the start of the 2016-17 season, but it does add to the peculiar nature of the business side of hockey. The Blues have a championship win on the brain and hopefully No. 42 can be a part of that. Another one of St. Louis’ biggest issues of late has been their inability to keep two healthy goaltenders. Jake Allen was out for more than a month at the beginning of the 2016 leg of the regular season and shortly after his return, Brian Elliott fell to injury that still has him sidelined. Thankfully for the Blues, Elliott was able to hold his own in Allen’s absence and Allen is doing the same right now. They’re currently on a three-game winning streak, giving them a 2-0-0 record to start the month of March, after losing three in a row prior to that. Allen has posted a combined .936 save percentage in his last three starts that have seen him give up no more than three goals against per game. Arguably the biggest win was last night’s 4-2 victory over the Central Division foe Minnesota Wild, who had a winning streak of their own snapped by the Blues. Although they almost let the Wild back into the game after taking a 3-0 lead in the first half of the game, the Blues were able to hold on and defend their hard work for a big two points. The goals in last night’s game are also significant because they weren’t scored by No. 91. Three players with fewer than 10 goals on the year put the puck in the net including Patrik Berglund, who has only played in 27 of St. Louis’ 67 games on the season due to injury. Berglund’s goal was just his sixth of the year and 11th point of the season. Team efforts and winning streaks are the exact combination of what the Blues need in their last 15 games of the regular season. St. Louis will want to head into the playoffs on the right foot, which is only possible if they continue to play the way they have in their last three outings. The Blues are finding consistency at the right time of the season and continuing on their current streak could lead to another division-leading banner being hung in Scottrade Center come season’s end. 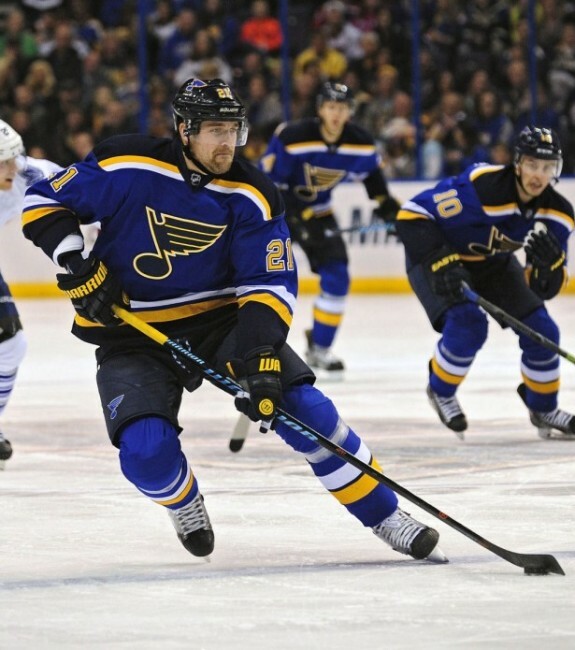 What do you think of the Blues’ play of late? Leave your thoughts in the comments below.